pies I will be honest. Baking isn’t my strong suit. I am not a patient person, hence I am not a good baker. But, I can make a killer pie crust. And, it just so happens that I love pie. I love all the pies, traditional pie, slab pie, fried pies, deep dish pie, and galettes. Today, I got the best pie for the person on the go, hand pies! Since I love pie and pumpkin season is just around the corner. I thought I make some scrumptious pumpkin hand pies. 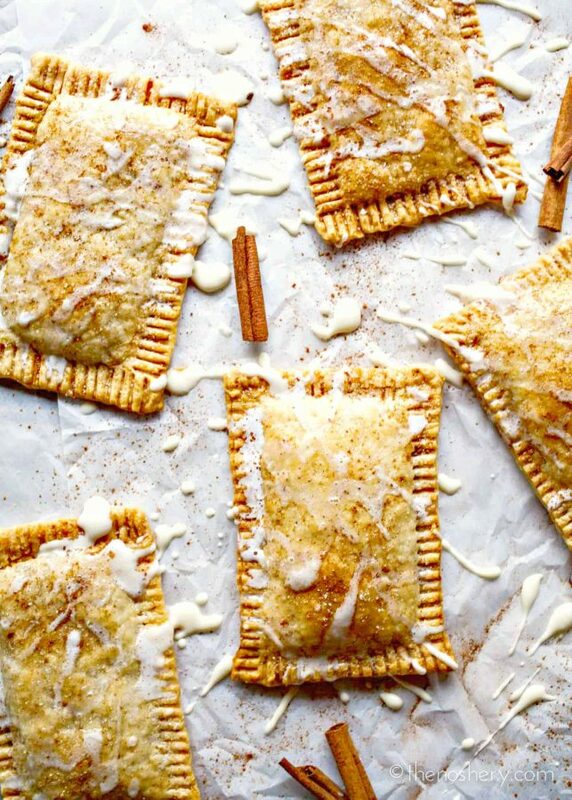 But, not just any pumpkin hand pies. 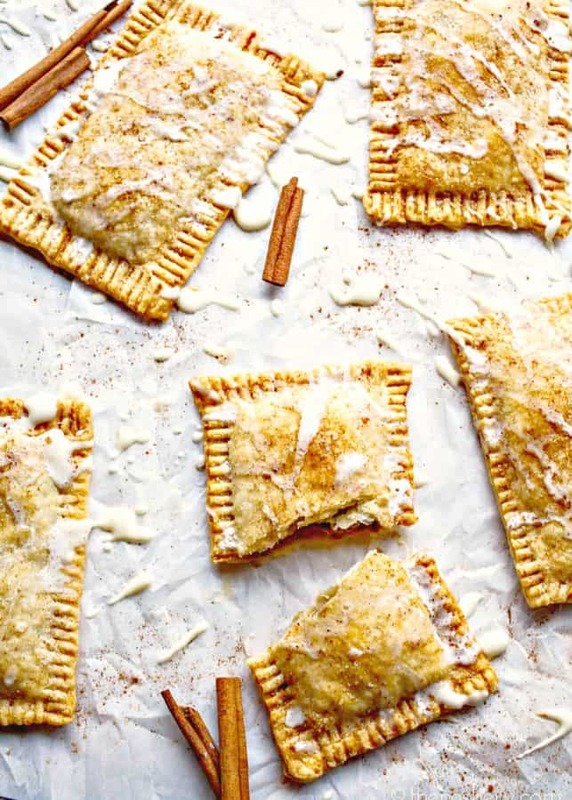 These pumpkin hand pies are spiced with warm and fragrant chai tea. When the temperatures begin to drop and I pull a sweater from the closet for the first time. One of my favorite things to curl up with is a hot cup of chai tea. There are a few things that scream fall to me; sweaters, scarves, pumpkin, and chai tea. A creamy chai spiced pumpkin filling is sandwiched between two layers of flakey buttery crust. It really is a delight to the senses. And a hand pie is the perfect pie to accompany a hot cup of tea while curled up on the couch with a warm blanket. Look at that delicious flaky crust and creamy pumpkin filling! Who doesn’t need that in their life? These little pies are great to make ahead of time. Freeze the pies between parchment paper and store in a resealable bag. This way you can have fresh warm pie on demand. 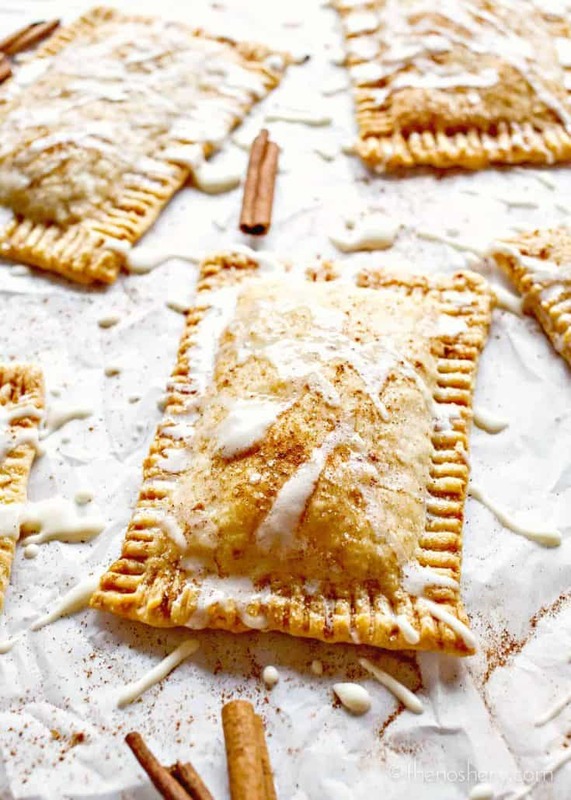 Chai spiced pumpkin hand pies for when you don't have time for a plate or a fork. 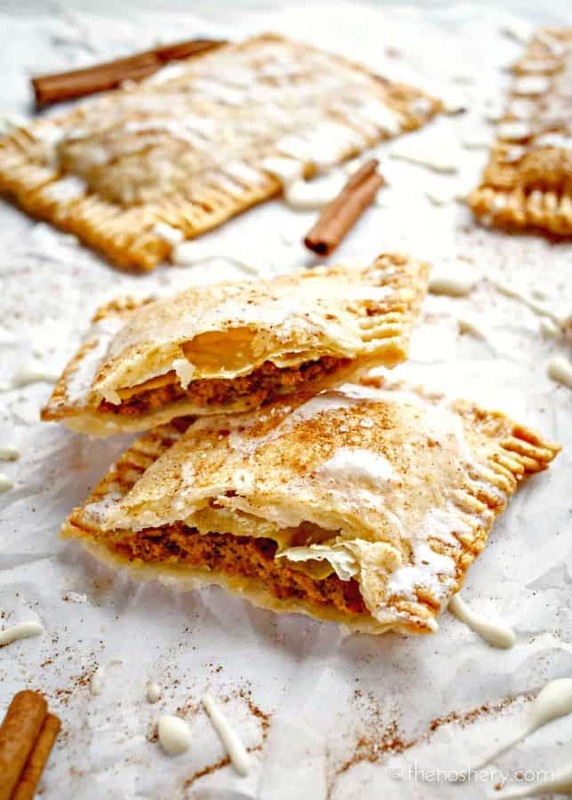 Celebrate the cool weather this fall with a pumpkin chai hand pie. Preheat oven to 350°. Roll out dough on a floured surface to a large rectangle. Cut into 12 (3.5 x 5.5 inch) rectangles. Combine remaining ingredients, including chai tea leaves, in a medium bowl, mix until well combined. Brush edges of rectangles with water, spoon about 2 tablespoons of filling in center of 6 rectangles. Top with remaining dough rectangles and press edges. Crimp the edges with your fingers and press with the tines of a fork to seal. 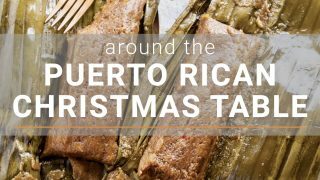 Place on a parchment-lined baking sheet, brush with heavy cream and sprinkle with raw sugar. Bake hand pies, rotating sheet halfway through, until pastry is golden brown, 35–40 minutes. Transfer to a wire rack over parchment paper. Sprinkle with cinnamon and sugar. In a small bowl combine icing ingredients and whisk until well combined. If needed, add more powder sugar or heavy cream a teaspoon at a time until you reach a drizzle consistency. Using the whisk drizzle the hand pies with icing. Serve warm or at room temperature. What do you do with the tea bags? I apologize, I should have clarified that the chai tea leaves are removed from the bags and added to the mixture. I have edited the recipe to clarify. Thanks, I’ll be making these soon for fall camping!! Sitting by the fire with a cup of tea and these!!! Yup I am making these ASAP! Yum! They look SO good! 1. Can you fry these hand pies? 2. The icing does it harden or stay soft? I ask because i plan on gifting these and for transportation and wrapping puposes I want to be prepared.